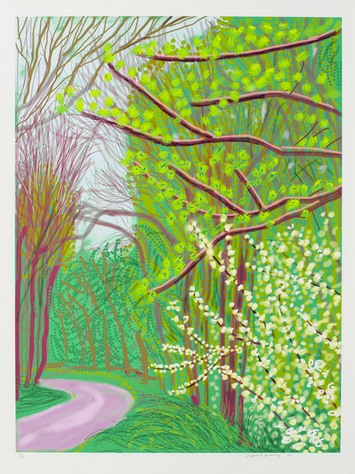 David Hockney returns to the Pace Gallery this month, showing a selection of new works that once again focus on the artist’s love affair with his Woldgate home, and the continued expansion of his decades of work as a painter into new media forms. Titled The Arrival of Spring, the work is another entry in the artist’s documentation and depiction of the landscapes of rural Britain. Having moved back to Woldgate in 1999 after decades in Los Angeles, Hockney delved deep into the landscape, creating vivid and fantastic paintings of his surroundings. The sweeping lines and gentle, bending curves of his tightly honed practice found their perfect counterpart here, as the artist committed himself to the forking roads and swaying groves of trees dotting the countryside. But Hockney’s new focus over the past decade is matched by another fascination, that with new media technologies. Over the past 5 years, the artist has increasingly worked on an iPad, using drawing programs to execute his work before magnifying them to considerably large size. The works in Arrival of Spring follow this trend. rendered in bold colors and definitive lines that sit quite well against the backdrop of his over half-century long career. 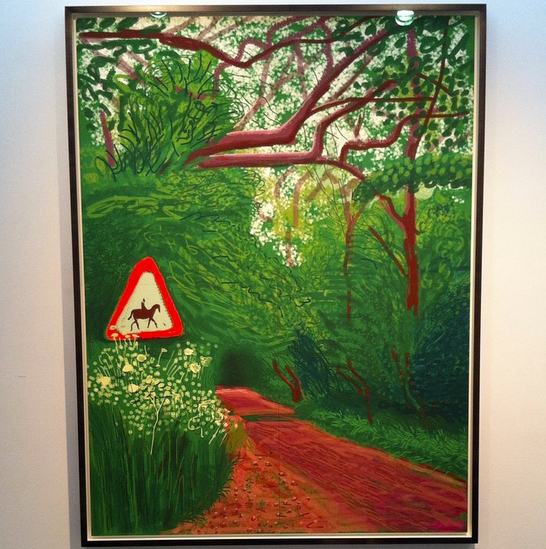 But while the artist’s hand can be detected in these new pieces, Hockney seems equally interested in what aspects of his own style do not transfer immediately through the touchpad interface of an iPad. 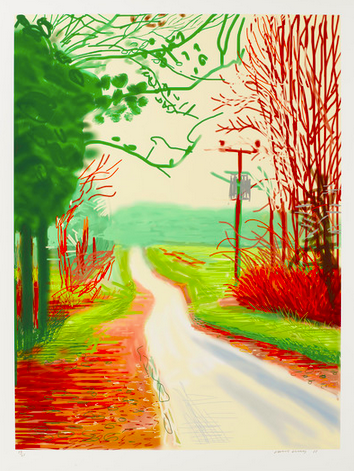 Colors and lines do not blend together in quite the same way, and Hockney’s additions of minor affectations (curls of green on the road surface, flecks of yellow in bushes) stand out, leaving the composition somewhere between a studied color drawing and a wildly free-flowing impressionist experiment. Restraint and pause, while clearly part of the equation, do not express themselves as clearly as the vivid energy of his lines and forms, and the abrupt changes in color used to express the shifting depths and lighting of the works makes for an occasionally jarring experience. 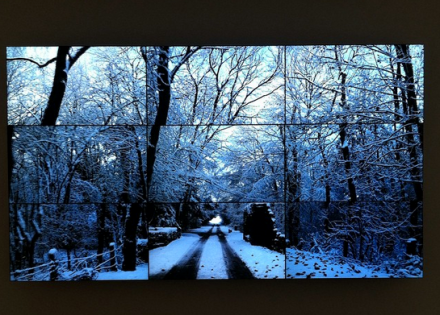 Also on view is one of Hockney’s new video installations, a nine-panel piece documenting the scenery of Woldgate as the artist moves a camera array mounted atop an SUV through the roads and woods of the neighborhoods surrounding his home. Rendered in pristine, stunning HD, the work is perhaps the strongest counterpoint, to the artist’s recent drawings, and a fitting summation of Hockney’s recent embrace of new technologies. 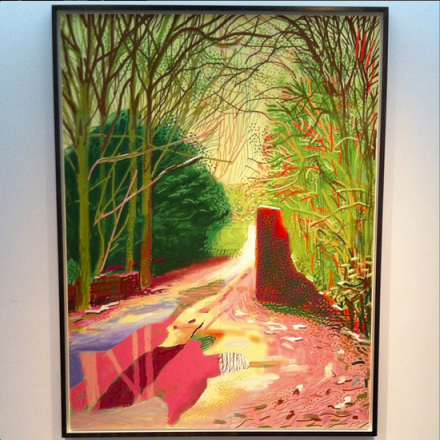 While the subject changes only slightly, Hockney’s techniques of expression and depiction allow ever-shifting perspectives and modes of seeing his beloved countryside, a cogent point that, much like spring itself, fundamentally alters the view of a given landscape. The Arrival of Spring is on view through November 1st. This entry was posted on Saturday, October 4th, 2014 at 12:00 am	and is filed under Art News. You can follow any responses to this entry through the RSS 2.0 feed. You can leave a response, or trackback from your own site.